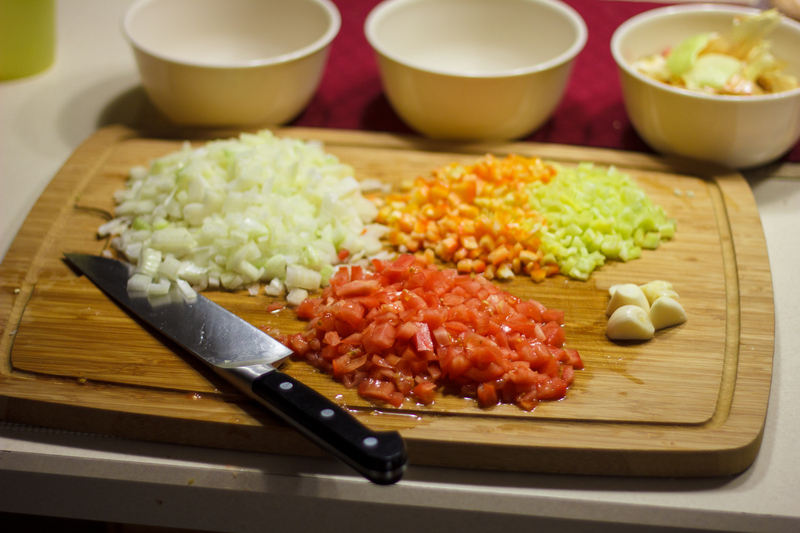 Give a nice uniform chop to your peppers, onions, and tomato. I personally press the garlic for this recipe, but if you don’t have one, throw a fine chop on the garlic. Keep the onions separate from the other ingredients. Slice the chicken breasts length-wise. 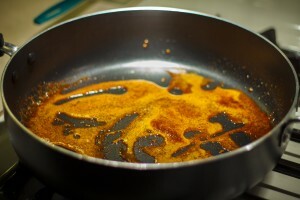 Heat up the bacon fat in large frying pan and add the paprika*. Saute the paprika for about 1 minute. 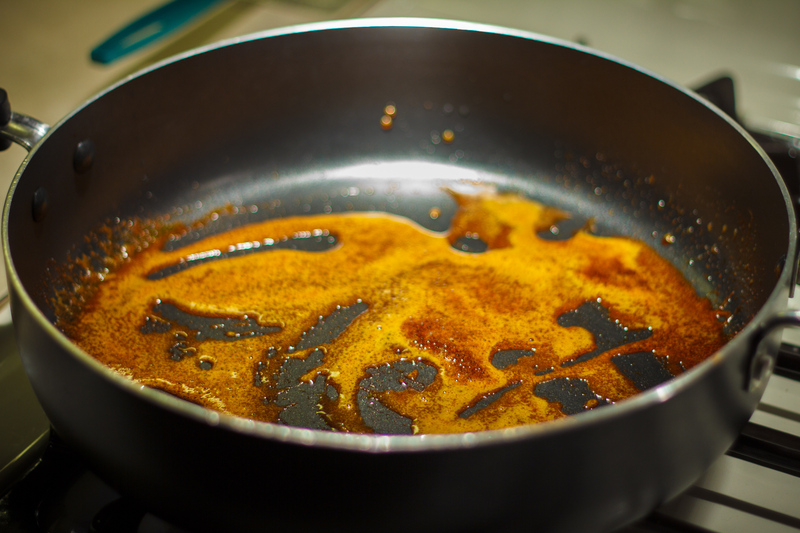 If you don’t have bacon fat (shame on you), you can use any light cooking oil (read: not extra virgin olive oil). *I can’t recommend the old-school “red box” Hungarian paprika enough. If you’re looking for some creative options, you can use hot or smoked paprika as well. 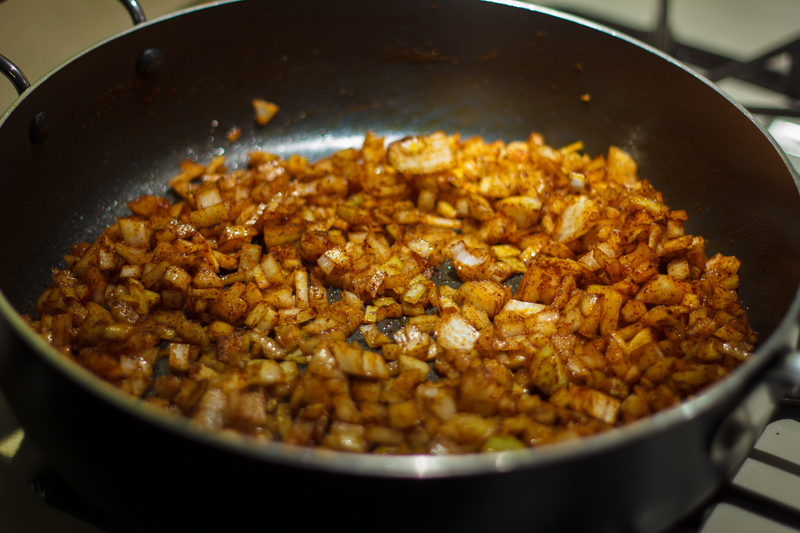 Add the onions and saute for ~3 minutes. Season the onions lightly with salt and pepper. 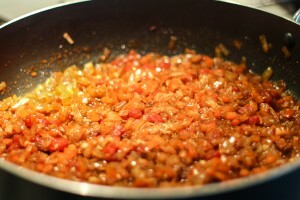 Add the peppers, tomato, and garlic to the pan. Reduce heat to medium and cook for ~10 minutes. Remove veggies from the pan and set aside. SEASON the chicken breasts on each side with salt and pepper and get a sear on them. You want to get a nice medium brown color. 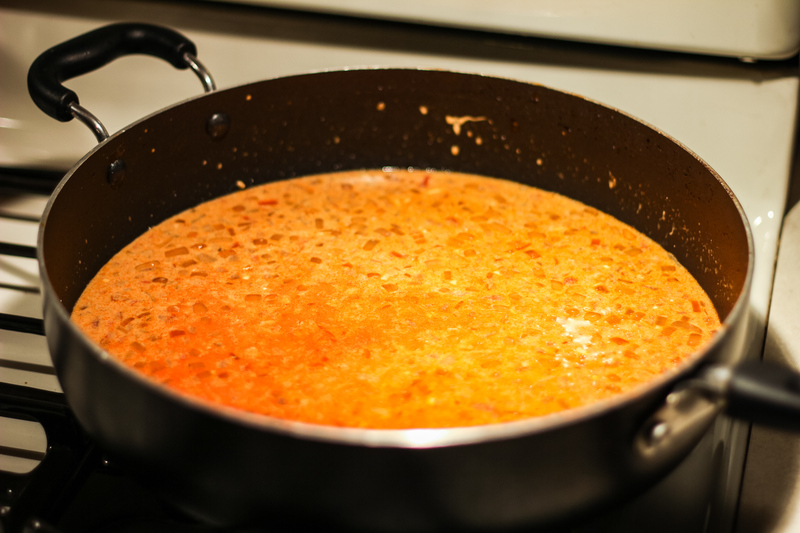 Depending on how hot your stove can get, it’ll probably take ~4 minutes per side. 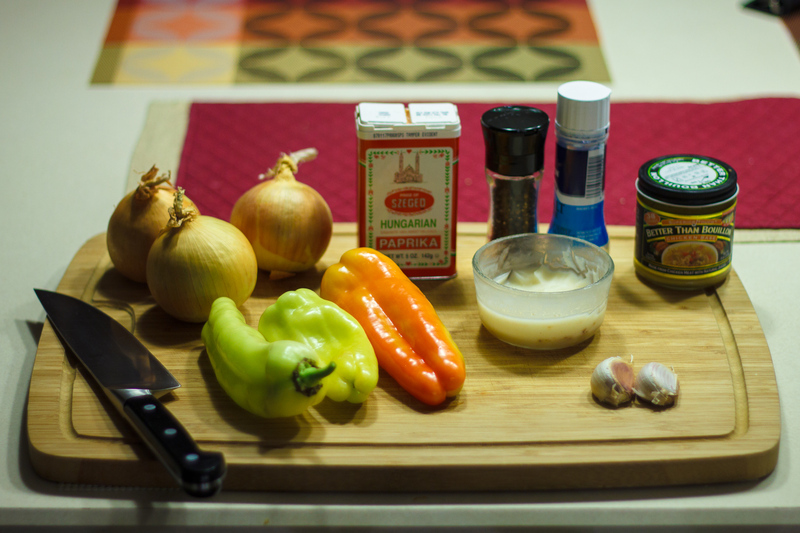 The chicken will be simmering with everything for ~30 minutes, so you don’t have to worry about them being cooked-through. You want the sear for little extra flavor. 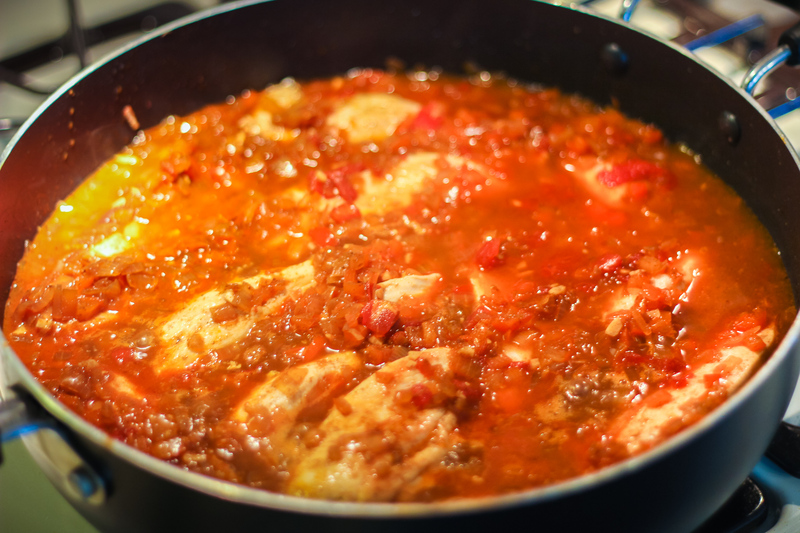 While the chicken is searing, mix up your thickening ingredients. Remove the chicken and add the vegetables back to the pan with no heat. Add a cup of water, the chicken bouillon, and the thickening. This will cool the ingredients down enough so that the sour cream won’t curdle. Stir until uniform. 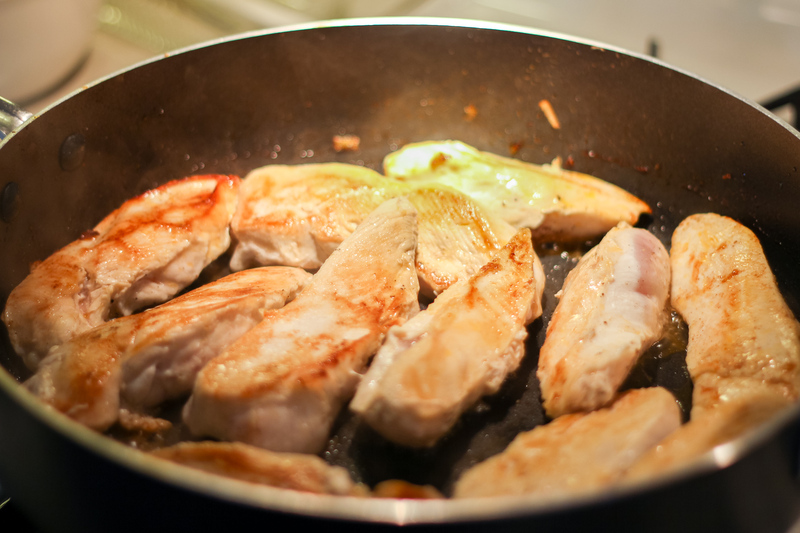 Get it back on the heat and return the chicken to the pan. Bring it up to a boil and then back it down to medium. Cook covered for ~30 minutes stirring occasionally (simply to prevent burning). While this is happening, cook up whatever you’d like to serve it over. I personally like a good egg noodle the best, but you may want couscous, rice, dumplings, etc. Of course, I also recommend a good crusty roll! When it comes to cooking the egg noodles, do it with salted water! Potako’s Chicken Paprikas – Done! 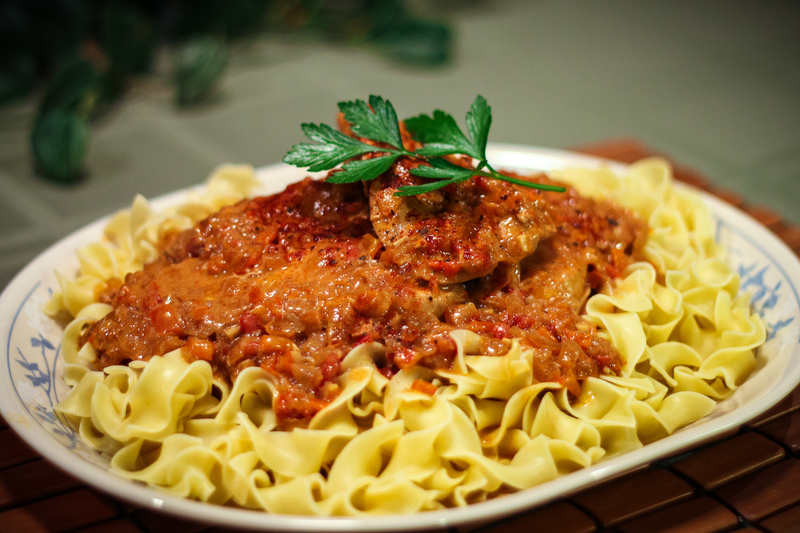 Place the chicken on top of your noodles and spoon a bit of the sauce over the top. 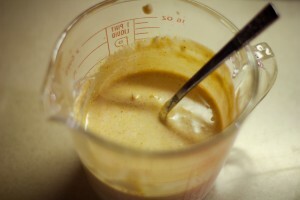 Add a subtle garnish of paprika and some black pepper to be fancy. If you really want to be a show-boating fruitcake, add some flat-leaf parsley.